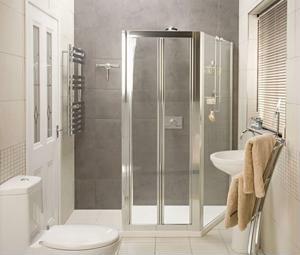 Bathroom Vanities and Accessories Design and Tips | DecorPlanet.com Blog: You're done knocking down walls - what kind of shower will go in its place? You're done knocking down walls - what kind of shower will go in its place? Once the heavy grunt work of your bathroom design project is out of the way, planning out what to do with the rest of your gutted space will be tricky. Choosing the right shower or whirlpool in your bathroom will be informed by a number of factors, from your age to the amount of space and its decorative potential, according to HGTV.com. There are countless combinations to choose from when shopping for a shower setup, but one of the most common is the bathtub and shower combo. This will allow you to incorporate any number of adjustable showerheads and faucets while giving you the option to enjoy a soothing soak after a long day. When you've decided on the alignment, consider placing small cubbies inside of your walls to store small bathroom accessories and toiletries. This will add a unique touch to your washroom and improve the versatility of your space. Whether you choose an elegant whirlpool or a space-saving tub and shower, there are countless ways to incorporate your own sense of style into the space. How will you help your shower stand out from the pack?